Reviewed by Larry Gleeson. Viewed at the Santa Barbara Film Festival 2016. Santa Barbara International Film Festival (SBIFF) Programming Director, Michael Albright, a talented Santa Barbara City College Associate Film Studies Professor of Documentary Film, moderated a widely diverse, yet talented panel of documentary filmmakers this morning, February 5, 2016, at the Engels and Volkers Pavilion as part of the SBIFF *Free Admission Filmmakers Seminars, before an audience including many students in the Santa Barbara City College Film Studies Film Festival Course and several participants from the SBIFF Film Studies Program as well as a throng of Santa Barbara community filmmakers. Albright announced the participants to the audience and proceeded to politely ask the panel members to introduce themselves respectively. Jeff Bowden started by revealing the inspiration behind his film – a photograph given to him by his daughter. It wasn’t just a photograph, however. The photo was hanging in a War Photo Limited gallery in Dubrovnik, Croatia when War Photo was exhibiting work by female photographers. Among the cataclysmic cover photos of bombed out buildings and incinerated automobiles was the face of an Albanian boy with an expression Bowden has carried with him ever since. In an effort to uncover the boy’s identity, Bowden embarked upon a journey that has included six trips to Kosovo and has culminated in A Single Frame. Next, Jeffrey Brown, a veteran filmmaker with over 20 films including a number of award-winning global features and documentaries. His latest work Vinyl Generation, examines the influence a renewed interest in vinyl LP’s had on Czech Generation X during the 1980’s. Picking it up, Academy Award Nominated and multi-award winning filmmaker Lilibet Foster captured the moment as she shared her emotional, heartfelt journey in capturing the wrenching saga, Be Here Now (The Andy Whitfield Story). Not one to sit idly by, Laura Gabbert, grabbed a hold of the microphone and mesmerized the audience with her shot description showcasing the City of Angels – Los Angeles, California – in her expose, City of Gold, about flamboyant, Pulitzer Prize winning food critic, Jonathan Gold. The film premiered at Sundance 2015 and was picked up by IFC/Sundance Selects and is slared for a March 2016 theatrical release. Also, Gabbert received her MFA from the UCLA School of Theater, Television and Film. Wrapping up the introductions was Leanne Pooley, a New Zealand filmmaker with over 20 films under her belt including her the recent 25 April, an animated excursion into a retelling of the bloody and ill-fated Gallipoli campaign form the annals of World War I. Seemingly, such an extraordinary self-described introduction would have been satisfactorily enough for most audiences. Albright, however, with a sense of his audience demographic peppered the panel with intelligent questions to draw out the inner workings of these successful, highly charged filmmakers. For example, how do you as filmmakers balance creativity with financial realities. It appeared as though a strong illumination surrounded the group as the response button was activated immediately after the question left Albright’s lips. 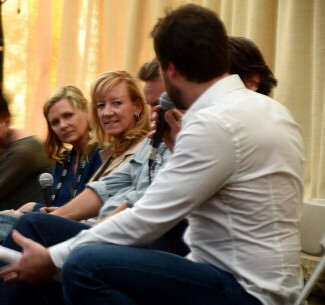 Answers varied from panelist to panelist eventually sequeing into narrative structure, the importance of storytelling versus topical material, film distribution channels, production, post-production and the ensuing miracle inherent to the magic of filmmaking. And, what started out as a Filmmaking Seminar on Documentary Film morphed into a master filmmaking class running the gamut from the inspirational spark to finished product. A deep going review by Larry Gleeson, if you didn’t see the seminar, just read this review and you will get a spot on viewing about the seminar. A bit to much background information instead of writing about the topics that were discussed. As Larry says, Michael continuously ask intelligent and hard questions to the panel. It was easy to see that some of the participants was struggling to come up with a answer that fits the question. At the end, it wasn’t much for the viewers to ask. Great work to both Larry and Michael.